One-line review: Mythology excavated, history re-incarnated. 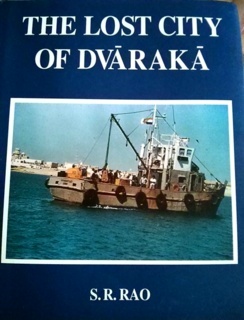 Short review: Arguably the single most important archaeological excavation of the twentieth century, the offshore marine excavations off Dvaraka began with a humble eighty thousand rupee grant. 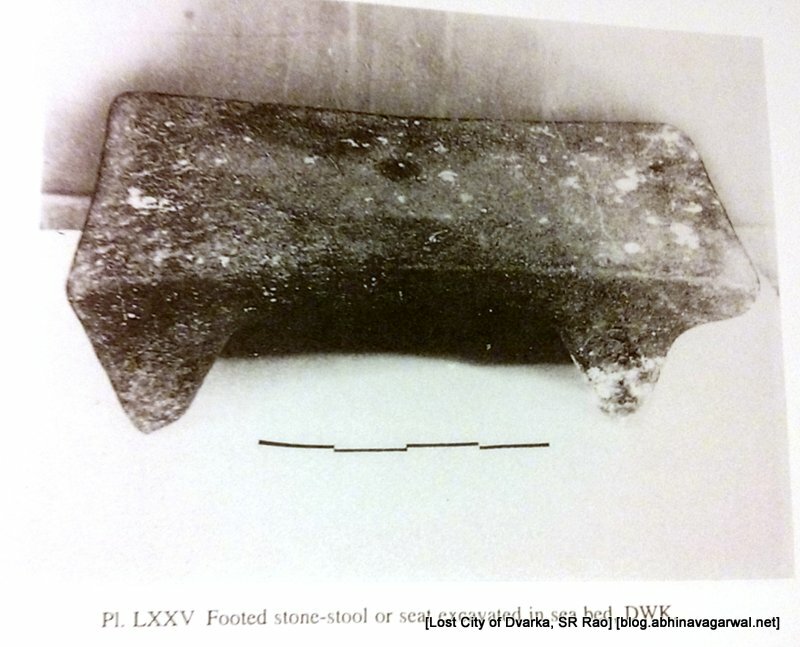 It helped plug in a thousand-year hole in India's ancient history - of what happened after the decline of the Harappan civilization and before the advent of the Buddha in the fifth century BCE. In the process was also established the historicity of a certain gentleman named Krishna Devakiputra - also known as the eighth incarnation of Narayana, Lord Vishnu. These two stunning implications of the excavations have not yet been fully appreciated, thanks to a benign neglect of archaeology by the government, the warped revisionism practiced by Marxist historiographers in India, and the Indian's general apathy to history. This book is the story of those excavations, written by the late S.R. Rao - the person who led the excavation project in the 1980s (S.R. 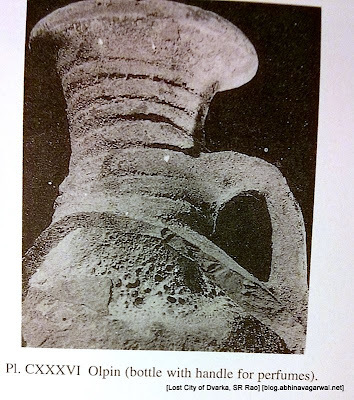 Rao also led the archaeology excavation that discovered the Harappan port of Lothal in 1954 - also see my blog post). 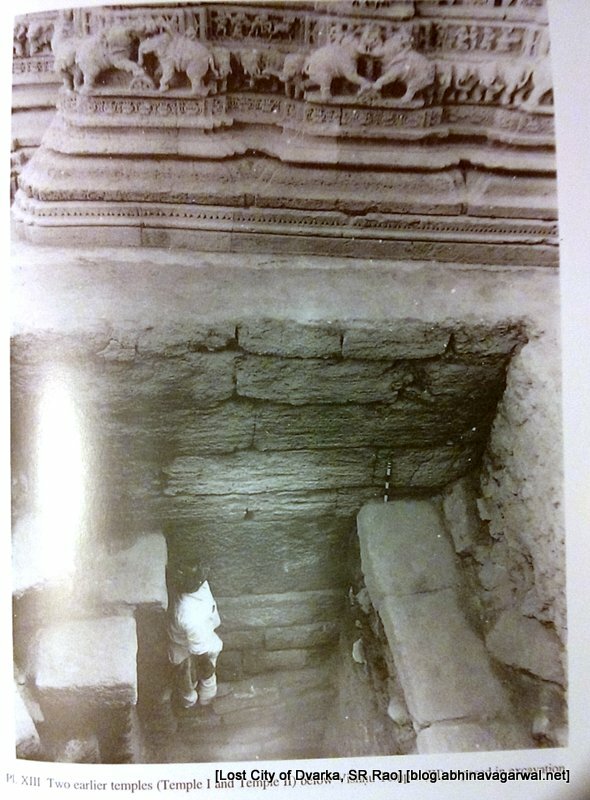 This search for an earlier Dvaraka led to excavations in 1963 by Z.D. Ansari, later in 1979-80 by S.R. Rao, and which finally led to the first offshore marine excavations in India, in April 1983 onwards. 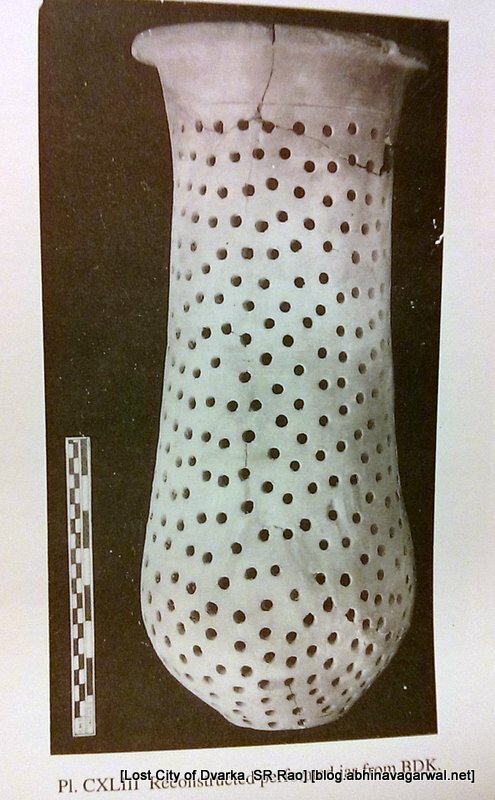 These culminated in the discovery of a human fortified settlement dating back to approximately 1500 BCE. The book combines an encyclopedic knowledge of history, geography, and mythology with an expert's grasp on archaeology to present this concise book, lavishly produced by Aditya Prakashan, and with more than a hundred color and black-and-white photographs, printed on glossy paper. Given the high cost of this hardcover book - Rs 1800, perhaps a lower priced paperback edition is long overdue. Dwarka'a modern claims to fame are the Reliance group's massive oil refinery in nearby Jamnagar, and the Tata Chemical's petrochemical plant and the Essar group's refinery complex in Okha. And yes, there is also an operational command center of the Indian Navy and Coast Guard also there, but that is to be expected, given the town's proximity to Pakistan - less than 350kms as the crow flies from the strategic Pakistan port of Karachi. Dwarka's other claim to fame, and of the more everlasting variety, is that it is one of the four holy pilgrimage sites (chaar dhaama) as established by Adi Shankara., Dwarka is otherwise a sleepy little coastal hamlet at the tip of the country's western maritime border, frequented only by the devout to see Lord Krishna's temples there. Of the temples dedicated to Lord Krishna at Dwarka, there are two of note here. The first is the massive and majestic Dwarkadhish Temple, (see my post) also known as Jagatmandir, whose "sanctum, also called Nijmandira, with a sikhara of its own, is assignable to the 12th-13th century AD, while the rest of the grand edifice including the five-storeyed mahamadapa standing on 72 carved pillars belongs to the 15th century AD." The second is on the "island of Bet Dwarka, ... and is said to have been the pleasure resort of Krishna. His consorts Satyabhama and Jambavati are believed to have lived there." This island is also known as Sankhodhara or Sankoddhara, because of the copious quantities of conch shells found there. There is also a story in the Padma Purana where Sankodhara tried to steal or destroy the Vedas, and Vishnu assumed the form of a fish to kill him. The "Gargya Samhita has a different version about Sankhodhara." According to mythology, Dvaraka had before that been known as Kushasthali, and had been abandoned by King Revata after repeated attacks on the town. When Revata returned, he found Kushasthali now settled by the Yadavas, in what had become Dvaraka. King Revata then married his daughter to Balarama. Returning to archaeology and history, the the present temple dedicated to Lord Krishna at Dwarka could be dated to only about half a millenium back. Using archaeology, how far back could the history of Dwarka be pushed? 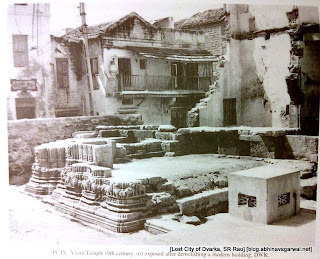 So, these first excavations - onshore, near the main Dwarkadhish Temple itself - had been able to push back the history of the temple town to two thousand years before present. 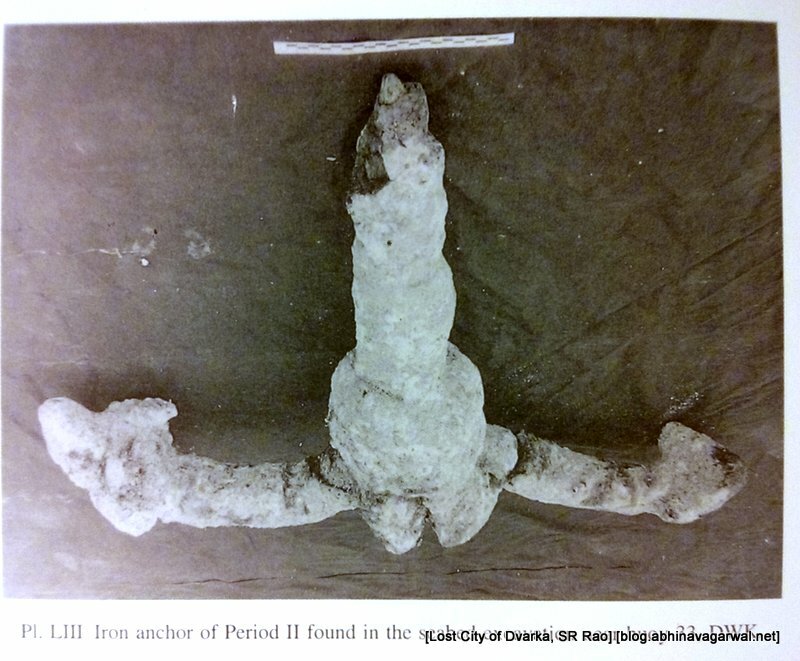 Some twenty years later, more excavations would take place, this time offshore - a first for India, and with results that would be nothing short of stunning for history and mythology. The stage was set for the archaeologists to go underwater, but before going any further - literally and metaphorically, it is useful to describe what the Hindu epics have to say about Dvaraka and why it becomes relevant in the context of the offshore marine excavations that followed in the 1980s. History and mythology are so deeply intertwined in Hindu epics like the Mahabharata, the Ramayana, and the Puranas that it becomes a difficult job, even for the best of minds, to separate fact from fiction from embellishment. The Mahabharata is called itihaasa, or history. While most scholars agree that the events described in the Mahabharata, or for that matter the Ramayana also, are based on a factual, historical core, there is substantial debate and disagreement over the extent of the embellishment and additions that have taken place over the following thousands of years. For example, the Mahabharata talks about a billion people dying in the war at Kurukshetra, a number which is most certainly an exaggeration. The exaggeration is perhaps meant to remind the reader of the scale of the huge loss of life over the eighteen days of battle on the fields of Kurukshetra. On the other hand, scholars are mostly unanimous that modern day towns and places like Kurukshetra, Indraprastha, Mathura, etc... are the same as those mentioned in the Mahabharata. However, what is one to make of the characters in the epic, especially Krishna? Was Krishna a historical figure? Did he live and die during the Mahabharata period? And what about his divinity? Was he an incarnation of Narayana, the eighth avatar of Vishnu? Did the Yadavas really migrate from Mathura, "founding a new city known as Dvaraka at the former site of Kushasthali in Saurashtra"? 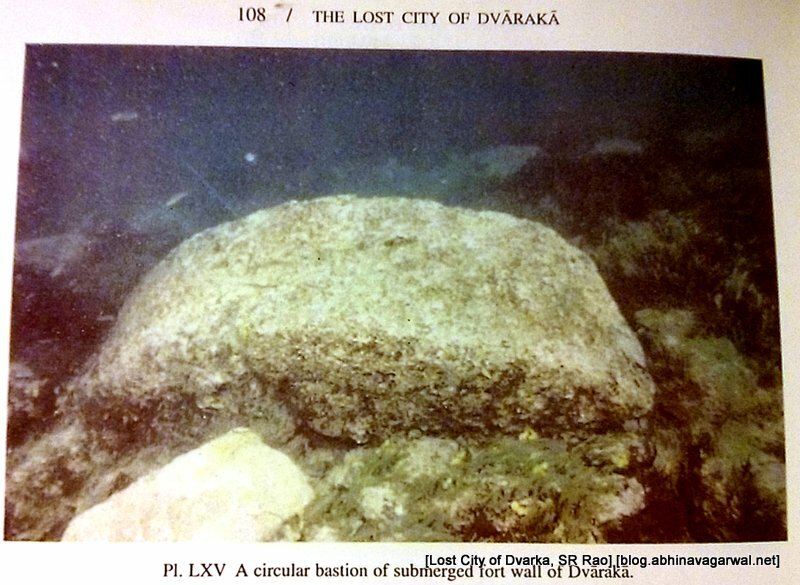 Did the city of Dvaraka really get submerged by an angry sea? While the question of Krishna's divinity is unlikely to be settled in any conclusive manner any time soon, and will likely remain a matter of faith, the question of Krishna's historicity is the more fascinating one here, and the more tantalizing one. No single place is associated more closely with any character in the Mahabharata than Dvaraka is with Krishna. The city kingdom that he founded, and whose destruction he foresaw, and which remained submerged for thousands of years. Krishna - the person, the incarnation - has influenced the course and evolution of Hinduism more than any other single figure in the last two thousand years, perhaps even more than Rama. It is therefore natural to expect historians, sociologists, archaeologists alike to want to learn as much as they can about the historicity of such a person. There are several references to Dvaraka in the Mahabharata, including detailed descriptions of the flora, fauna. geography, landscape, and fortifications there. Without any tangible physical evidence of these, the historicity of the mythical city of Dvaraka and of its founder, Krishna, remained rooted in mythology. It may be argued that even Mathura is as closely associated with Krishna as Dvaraka, and therefore why should the search for Krishna not take place there first? Reasonable question, but what makes this search well nigh impossible is that Mathura has been continuously inhabited for millennia, and any traces of the ancient kingdom of Mathura have been long destroyed and buried beneath modern constructions and successive settlements. Dvaraka, on the other hand, has remained submerged at sea - assuming that the mythology had any kernel of truth in it - undisturbed by human hand or habitation for thousands of years. It is therefore more likely to provide us with a truer and undisturbed glimpse into the past. Since the discovery of the Indus Valley Harappan Civilization in 1920 and the subsequent excavation of more than three thousand sites along the Indus and the Sarasvati River basins in the following decades, it has been established that this Bronze Age civilization started to form around 3500 BCE, and reached its peak - also known as the Mature Phase, between 2600 - 1900 BCE. Thereafter, for various reasons - a major cause being the drying up of the Sarasvati River, which after 2000 BCE got steadily reduced to a rainfed, seasonal river - the civilization began to dissipate and wane. The period between 1900 BCE and the 6th century BCE is also known as a "Vedic Night" of sorts, till the rise of the Mauryan Empire and the emergence of Gautam Buddha marked the resurgence of the Indian civilization. As the Harappan Civilization dissipated, the migrants "who came to occupy small villages in Saurashtra and Sarasvati-Yamuna basins, ... small republics - janapada - appear to have mushroomed in the second quarter of the second millennium BC." These Mahajanapadas tried to expand their sphere of influence, and in general were marked by a decline in moral values. Kamsa of Mathura perpetrated infanticide. Narakasura (in Pragjyotisha, possibly in Assam) had captured several thousand women. Jarasandha of Magadha had imprisoned close to a hundred kings, and planned to murder them. Kalayavana and Jarasandha had mounted at repeated attacks on Mathura. Salva had launched a devastating aerial attack on Dvaraka. "Sudikshina, son of the king of Kashi" had attacked Dvaraka, enveloping it in fire. And the Kuru empire had cheated the sons of Pandu of their kingdom, and even attempted to have them burned alive. That the Mahabharata is based on a factual core is mostly accepted. What makes it special is its extensive coverage of geography also. S.M. Ali in 1966 wrote that the Mahabharata is "perhaps the only great work which deals with geographic details and not incidentally as other works." 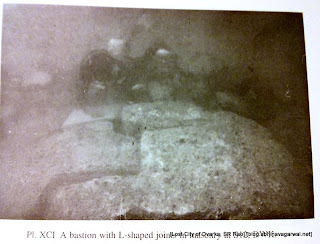 However, when it came to its historicity, some like D.C. Sircar and others challenged that claim. These arguments and objections were "thoroughly discussed by historians, archaeologists and indologists at a Seminar held in Vidura Asrama in 1975." [pg 9] The "consensus of the participants" was that the "weight of the evidence is in favour of the war having been fought sometime in the fifteenth century BC" [pg 12]. This was on the weight of foreign historical accounts, while an earlier date could be formulated if one looked at conclusions from "different ... eras and teacher-pupil pedigree basis." Based on stories themselves from the Mahabharata, you arrive at a date of approximately 1500 BCE for the Mahabharata era. ""The consensus of the participants in the Symposium held by Vidura Seva Asram in 1974", on the basis of what is known about the Buddha, Mahavira, and Sankara, on the basis of archaeological evidence, and from the accounts of foreign travellers, that the War was fought sometime in the "fifteenth century BC." So there is considerable uncertainty - that spans an estimate of over a thousand years - about the dating of the Mahabharata era. 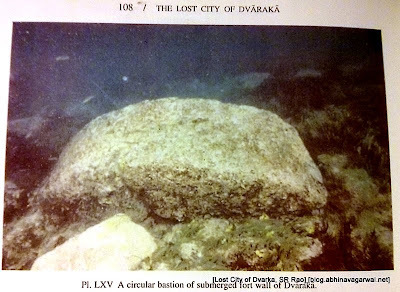 If the city of Dvaraka, as described in the Mahabharata, had indeed existed, then surely some evidence of it would have been available on the seabed near the shores of the present town of Dwarka. This then was the mission of the famed archaeologist, S.R. 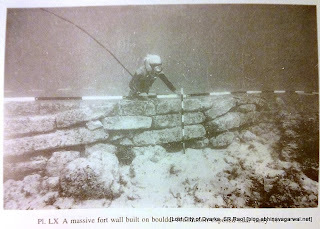 Rao, when he began preparations for the first marine underwater offshore excavations in India in 1983. 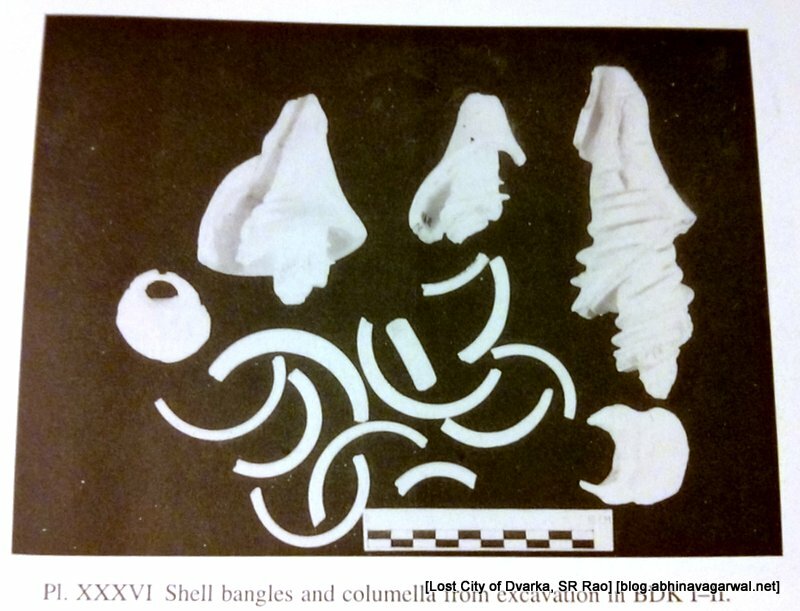 Successive onshore excavations had "yielded incontrovertible evidence of a protohistoric settlement of the 16th century BC destroyed by the sea, but the settlement itself had to be traced." This could be done only through offshore excavations. However, in 1980, "[S]earching for archaeological remains in the sea was entirely unknown in India". However, a visit by Prof B.R. Rao, Vice-Chairman of the University Grants Commission and Treasurer of the Indian National Science Academy, resulted in the grant of a "sum of Rs 80,000 was granted for a 2-year Project of Marine Archaeological Studies in India." And thus began the initial, tentative efforts at offshore excavations, the Samudranarayana Temple being the starting point. The challenges were many and severe. The photographs taken the first two years were unsatisfactory. Photographers from the BIO (National Institute of Oceanography) had to be trained in underwater photography. Since Mini Rangers (offshore positioning system) were not available, the team had to rely on the "sextant and theodolite" in the early years. Only in 1989 would they acquire a "Motorola Mini Ranger III". 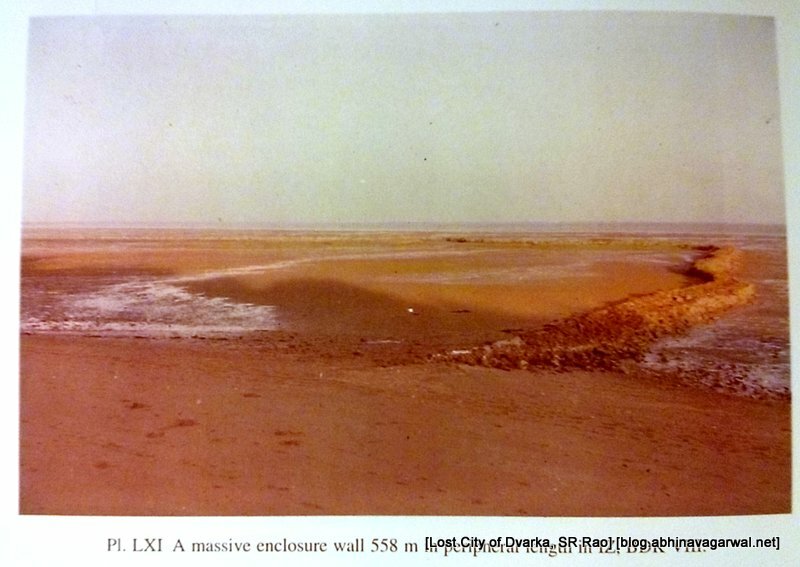 Even "large-scale and accurate shoreline maps of the last 100 years or more" were not available. Then there is nature. The sea around the Dwarka is unpredictable and can become "suddenly windy and choppy", and the best season for underwater excavations are from December to February and between 10 AM and 2 PM - when the sea "comparatively calm and the visibility good." The archaeology excavations uncovered pottery and shell objects "200 m seaward of the sites". 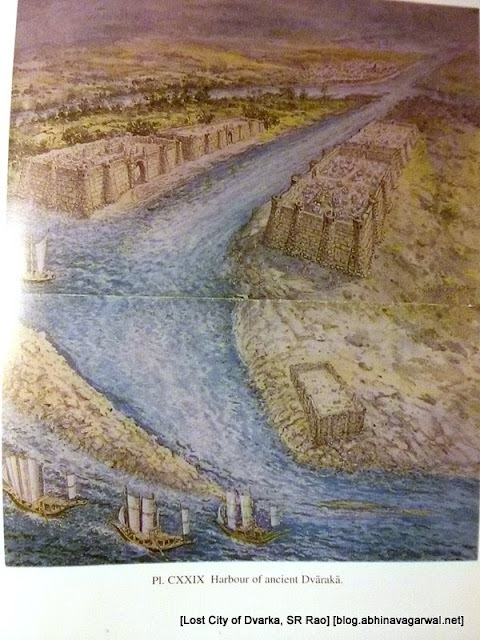 A study of the fortified settlement, now under water, suggested that it "is therefore reasonable to infer that during the last 3500 years there is a net rise of 4.6 to 5 m in the sea level here. The submergence of an ancient township is thus confirmed." 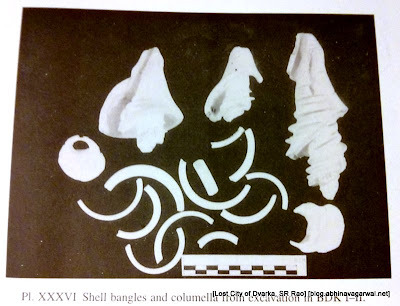 "A seal of conch shell, slightly damaged and engraved with a three-headed animal motif, was recovered", which corroborated the "statement in the Mahabharata that seals were used by the citizens of Dvaraka." 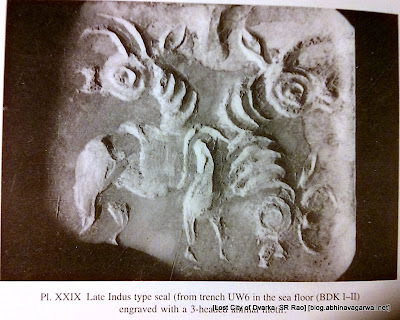 This seal is 18x20 mm, and "is made of conch shell and has a square button with a hole on the back for inserting a ring." Mythology had morphed into history, even as history itself had been made. 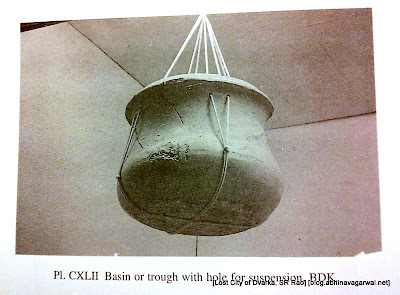 Between 1985 and 1989, the search for "other relics of ancient Dvaraka" intensified and during the "third, fourth and fifth expeditions ... a large number of structural remains ... were recorded." Since there was not enough space in the then town of Kushasthali, Krishna had requested the sea god to recede so as to provide more space, who had obliged. Thus goes the narration in the Harivamsha. 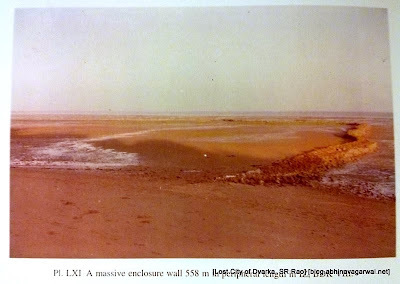 Basically it can be inferred that the residents of Dvaraka reclaimed land from the sea. "Massive blocks with L-shaped joints ... to withstand battering by waves and currents, proves that the engineers had the necessary skills to build port installations in the sea or in the intertidal zone." If there is one fault with this book, it is that Shri SR Rao has not structured his book as one would have liked. The best-written part of the book is the initial section where he takes the reader on a brief introduction to the mythology and chronology of Krishna, as described in various texts like the Mahabharata, Harivamsha, and the Puranasas. 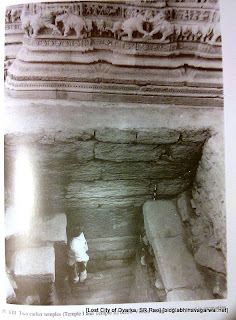 Once the author gets into the core of the book - the excavations - the narration frequently jumps between a technical, and at times dry description of the excavations and the findings on the one hand and the interjection of passages from the Mahabharata and Harivamsha on the other. These two strands do not coalesce well, and at times can frustrate the reader. I found myself going back and forth several times to piece together these somewhat disjointed nuggets of information. The book is short - less than 150 pages of text. Therefore this is a minor criticism of the book in my opinion. 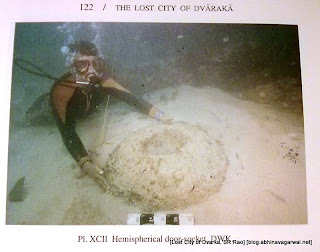 To conclude, the excavations at Dvaraka were the first underwater excavations in India. 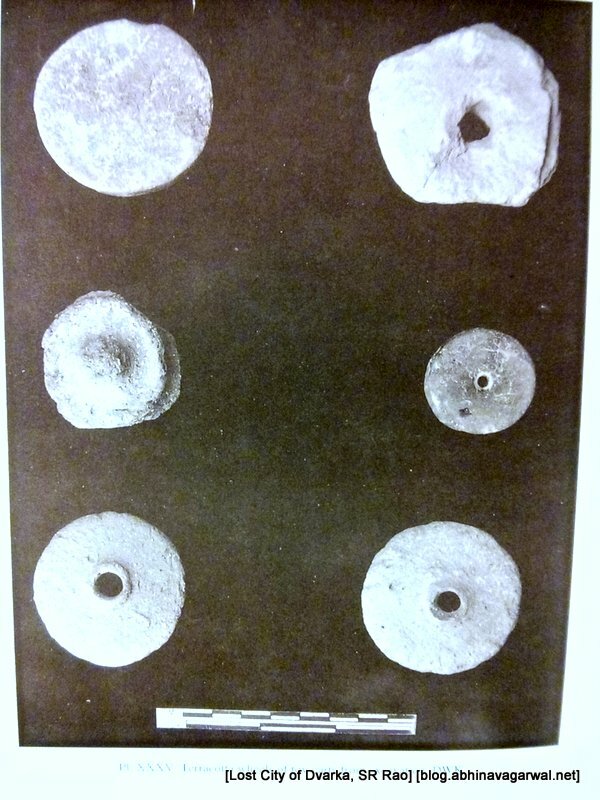 These helped push back the history of the town to about 3500 years before present. 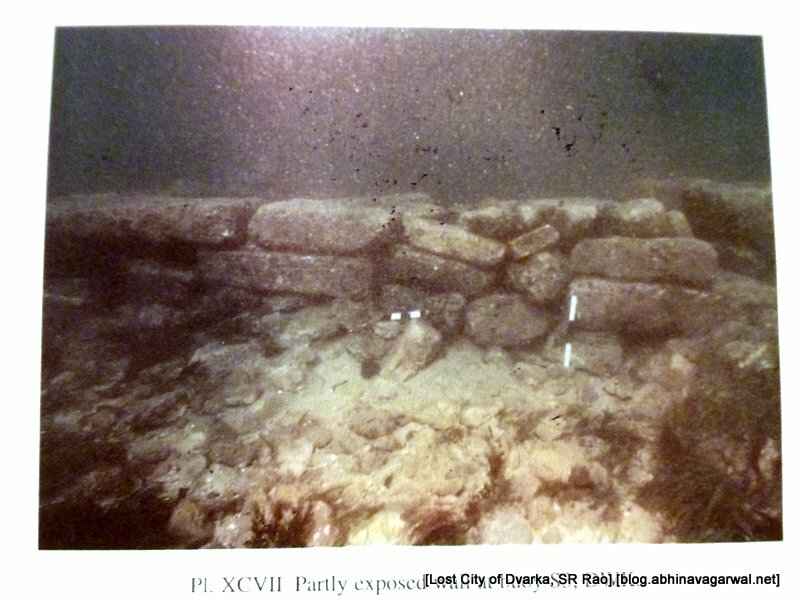 The underwater excavations brought to light a city that was submerged by the ocean around 1500 BCE. The engineers at Dvaraka knew the science of land reclamation from sea and also of construction on such reclaimed land - a first in the world. The engineers at Dvaraka, three and a half thousand years ago, also knew enough to make use of natural reefs to serve the needs of a harbour - another first. An examination of the underwater structures and findings proved that the submerged city of Dvaraka was the same as the one described in the Mahabharata. It is as clinching evidence as one is going to get of the historicity of Krishna, reasonably speaking. The divinity of Krishna had and will continue to remain a question of faith. History and archaeology have little role to play there.